Since smoothies are full of fresh fruits, vegetables, and protein and an ultimate way to jam pack as much nutrition as possible into one drink, we mix it up with lots of variety so the smoothies don’t get boring. As they’re ridiculously easy to make, filled with fruits and veggies, it makes you feel like a pro when you whip up a particularly delicious blend. 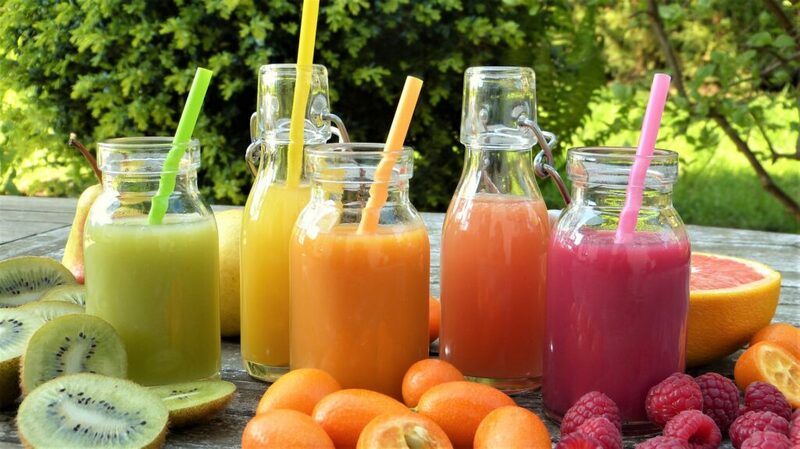 If you’re looking to put your own blender to use and start making smoothies at home, you’re already one step ahead because we found 5 super-food smoothies which are the perfect meal and full of vitamins to keep you energized. This is the most easiest smoothie to make with a limited time. Take out a can of yogurt, a bowl of oats, and some spices like nutmeg and cinnamon. Savor the taste of fall with apple cider that’s blended with Greek yogurt, rolled oats, pecans, cinnamon, and nutmeg. Serve it with some crushed ice in a smoothie glass. 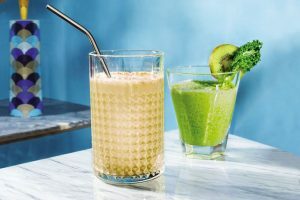 This delicious smoothie is rich in protein and beta-glucan, a fiber that improves running endurance. 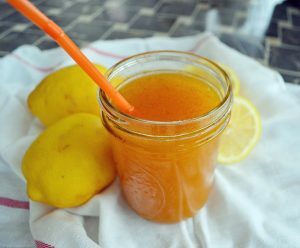 For this delicious drink you are going to need few ingredient like 2 cups Water, 1 squeezed, Lemon, 1/2 teaspoon Ground Turmeric, 1/4 teaspoon Ground Ginger, 1/8 teaspoon Cayenne Pepper, 1/8 teaspoon Cinnamon, 1 teaspoon Stevia or 1 Tablespoon Honey or Real Maple Syrup. Mix together, water, lemon juice, turmeric, ginger, cayenne pepper (optional) and cinnamon. Add stevia, honey or maple syrup to taste. The cayenne pepper adds a kick to it so not everyone can handle it. 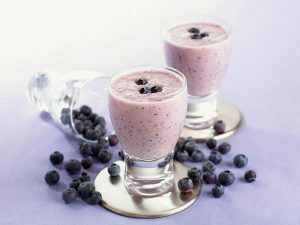 For this you are going to need 3 Tbsp water, 1 green tea bag, 2 tsp honey, some frozen blueberries, half med banana and little calcium fortified light vanilla soy milk. Microwave water on high until steaming hot in a small bowl. Add tea bag and allow to brew 3 minutes. Remove tea bag. Stir honey into tea until it dissolves. Combine berries, banana, and milk in a blender with ice crushing ability. Add tea to blender. Blend ingredients on ice crush or highest setting until smooth. 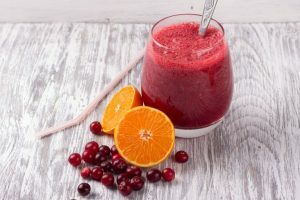 This heavenly citrus drinks provides a burst of vitamin C and refreshing tart flavor from a blend of cranberries and oranges. Frozen bananas and a hint of vanilla extract add balance, with a base of plain Greek yogurt for extra protein and creaminess. This blogger notes that oranges can be substituted for any other type of citrus, so if you prefer tangerines or clementines, feel free to swap those in. A splash of orange juice infuses summer citrus into this healthy and refreshing snack. 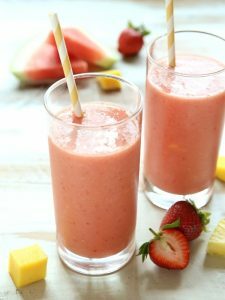 Choosea pack of mixed frozen berries or strawberries, half canned crushed pineapple in juice, half can plain yogurt, half sliced ripe banana and half orange juice. 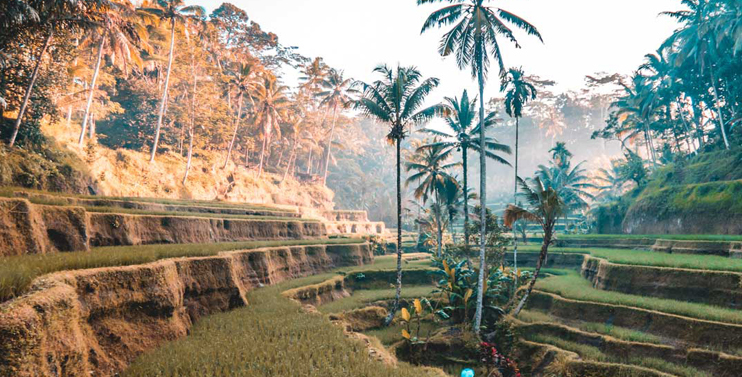 Combine the berries, pineapple (with juice), yogurt, banana, and orange juice in a food processor fitted with the metal blade, in a blender, or in a large measuring cup with an immersion blender. Process for about 2 minutes, or until smooth.